It's very interesting to change the mini militia skins or the avatars skin tones. There are lots of individuals playing mini militia. The developers have wonderfully customized mini militia skins. These skins are cool and give our avatar an eye cache appearance in the mini militia game. Let's see how to change mini militia skins. How to customize the skins in mini militia? To customize the mini militia skins and it's appearance, go to the Settings -> avatar -> you will find the customizing page with more options. The best thing is that in mini militia we can change the appearance of the avatar and skin tone based on our needs. There are lots of skin tone options found in mini militia. We have to choose our own style. With the help of mini militia skins options we can apply a good texture to the new avatar. We can also modify the shape of the avatar face, eyebrow texture and the appearance of mouth with an eye catchy expression that expose our reaction. In addition to that, there are other options available in mini militia skins to change our avatar hair style with different varieties of mustache and beard styles. Even we can dress the avatars based on our needs. In the pro pack version, lots of new and unique dress up features and few more customized mini militia skins are available. These are the option available in customizing the mini militia skins and by this way, we can make our avatar to resemble us. It also has features to rename your avatar with you own custom name. Many different avatar versions are also found in the hacked version as well. Few people play mini militia to unlock lots of new avatars. There are more advantages in having a different appearance because our avatar can reveal how experienced are we? Sometimes it gives a macho feeling ;) The other way to showcase the avatar and mini militia skins tone are to make that the mirror of our animated version. With this awesome trick, we can say who are they by seeing their avatar itself. We can also change our names based on the needs. And the default name will be NOOBIE. By changing the name our friends can easily find us during the online game. So always have a unique mini militia names. The most beautiful part is in mini militia skins we change and modify everything. We can customize the shape of the face, eyebrows and eyes and mouth to indicate our mood and character. In the next option, we can change the hair style and hair color lots of varieties available here. In the following tab, we can change the mustache and abs. The notable point is importance is given to small customization options and that also taken into consideration. This makes mini militia one of the best game. 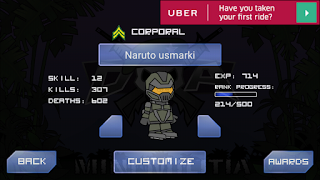 Enjoy mini militia with your own customized avatar.